History and prophecy. God uses both throughout time to display to all creation that He alone is in control. There is prophecy that tells what God will do, then, when God fulfills His promise, the prophecy becomes history. And then there is new prophecy. Some prophecies have already come true; others are yet to come. 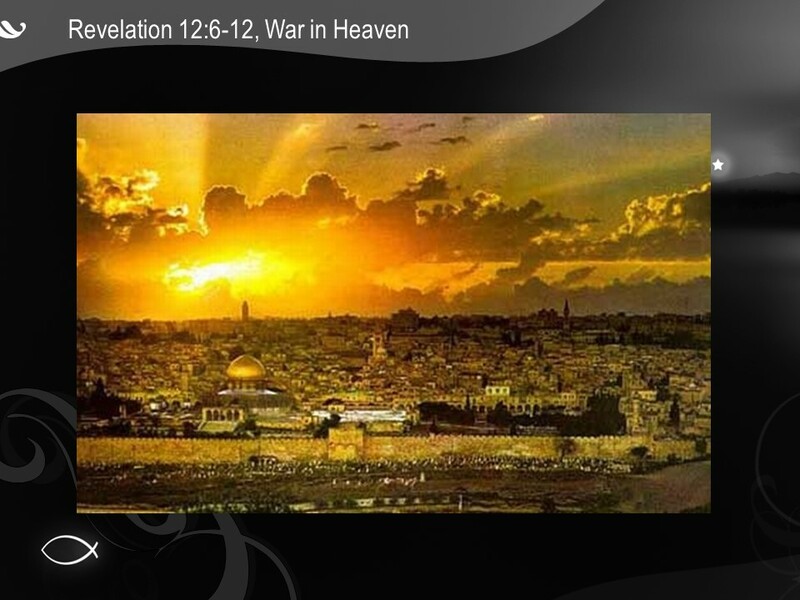 Open your bibles to Revelation 12 and this morning we’re going to study both prophecy and history and examine the battle between good and evil, God and Satan, throughout time, beginning thousands of years ago and is ongoing today and is still yet to come. Ever heard that statement, “Jesus never says He is God?” While technically accurate, if you’re a student of the bible you know it isn’t true. Jesus used word specifically to indicate to the Pharisees that Jesus was Lord, and the Pharisees turned him over to Pilate to be crucified for it. Also, the entire book of Revelation points to the deity of Jesus and His Kingdom and millennial reign. Revelation doesn’t even try to justify the deity of Jesus with words like, “Jesus is God because…” No Revelation just states it as fact. Today’s study is intense with symbolism, verse 1 begins with “a great sign appeared in heaven.” But just because it’s symbolic doesn’t mean it’s hidden from us, or cloaked in mystery. The passages of Revelation open up to us if we examine the scriptures carefully and try to understand each verse separately, then put them all together to understand the story that is being told. And Revelation is meant to be understood, it is “revealed” so we can understand our place in this world and the parallels in the heavenly realm. 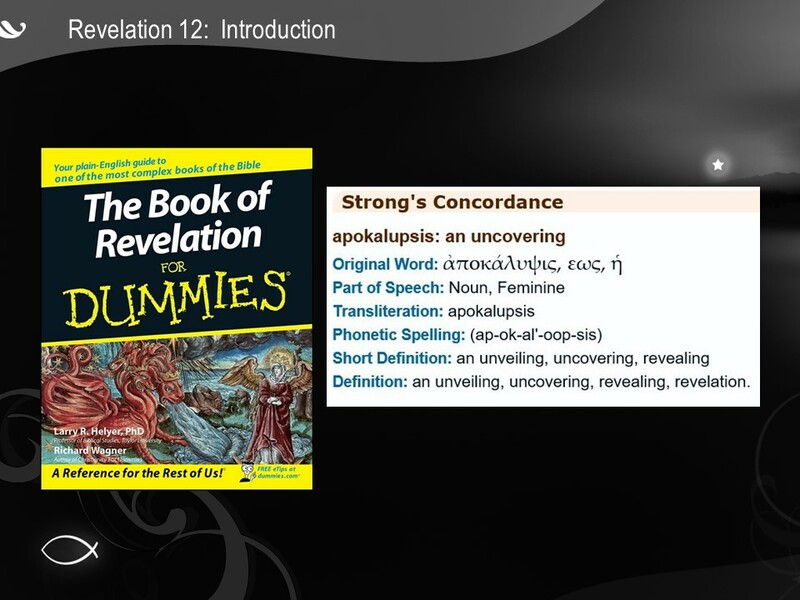 The Greek word for Revelation is Apokalupsis which means to reveal that which was before unknown. To reveal the things that have been, that are, and are to come. 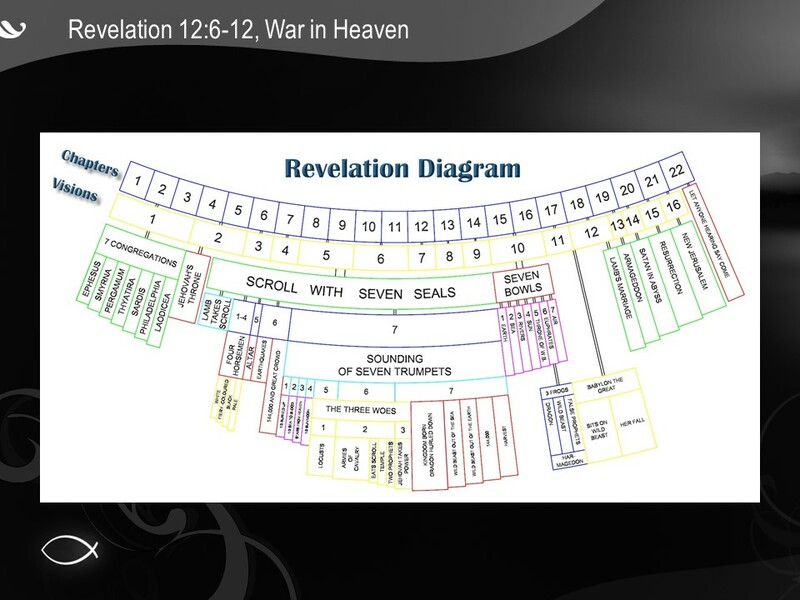 There is a system to understanding the symbology Revelation. First, search the immediate verses. Throughout Revelation, 26 times the interpretation is given in the immediate verses. If that doesn’t provide the interpretation, then search the Old Testament for the same symbol. There are 404 verses in Revelation, and 278 of them are explained in the Old Testament. Most of the symbology refers to Psalms, Isaiah, Ezekiel and Daniel. In particular, the visions of Daniel are represented. Our male child is the Messiah, savior of His people, ruler of nations. And when Revelation 12:5 says the male child was “caught up unto God,” it’s reminiscent of Acts 1:9, when Jesus ascended into heaven in sight of His apostles. The second character in our story is a dragon. And the dragon is the devil because I can skip down to verse 9 where it says the great dragon was called the devil. I could figure that one out on my own, didn’t need any bible study guides at all. The third character in the story is the woman, and she’s a little harder to figure out. For years some scholars posited that she was the early Christian church, but that can’t be right. The woman gives birth to the male child, and the Christian church didn’t give birth to Jesus. Quite the opposite – Jesus through His sacrifice opened God’s grace to the gentiles and the Christian church was born. Since the surrounding verses don’t positively identify the woman, let’s see if we can find our clues in the Old Testament. The woman is described as having the moon under her feet and a crown of twelve stars on her head. 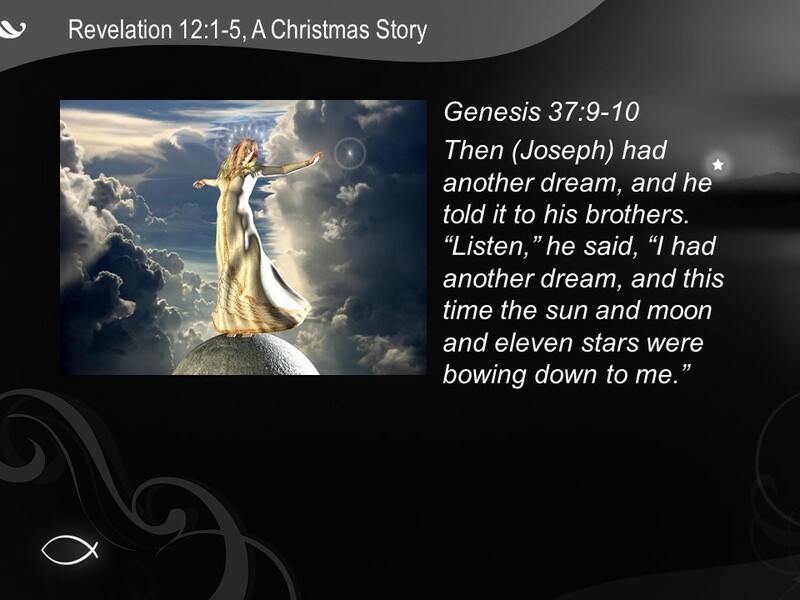 Let’s go all the way back to Genesis 37, where Joseph had a dream. Joseph was the son of Jacob who God renamed Israel, Joseph was Israel’s favorite, and Jacob’s brothers would eventually drop him in a deep well and leave him. But just before that, Joseph had a dream he told to his family. Joseph said, “Listen, I had a dream, and in this dream the sun and the moon and eleven stars were bowing down to me.” His father Israel rebuked him, saying, “What is this dream you had? Will your mother and I and your brothers actually come and bow down to the ground before you?” In this dream, we understand that the sun is Joseph’s father Israel, the moon is Israel’s wife Leah (Rachel had already died by this time), and the 11 stars are Joseph’s brothers who became eleven tribes of Israel, which Joseph becoming the twelfth tribe. The woman in Revelation 12, then must be Israel. The twelve stars are the tribes of Israel, and the woman brought forth Jesus, who brought forth His church. 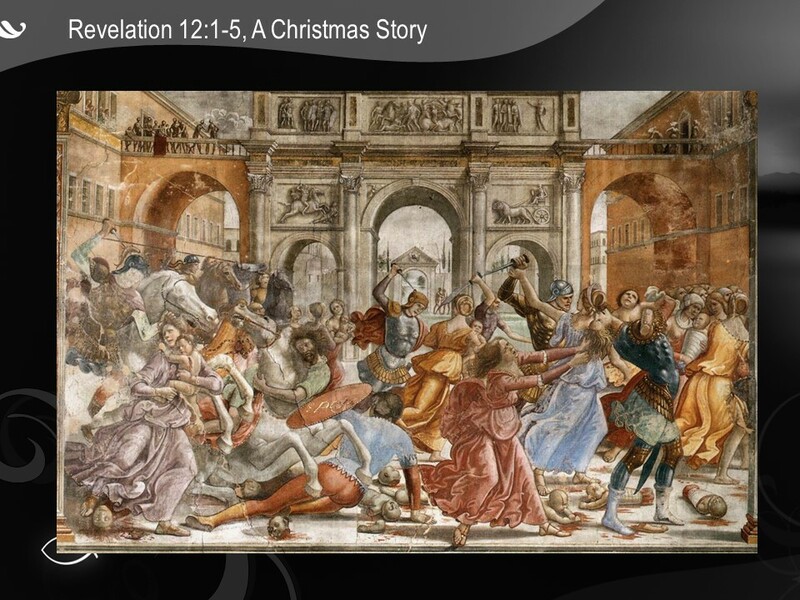 And then we realize Revelation 12:1-5 is the Christmas story as told from the heavenly perspective. Let’s look at the exact same story from the earthly perspective, told in Matthew 2 and is already very familiar to you. Jesus is born in Bethlehem. The Magi from the East, commonly referred to the Three Wise Kings, stop at King Herod’s and discuss the birth of the new King of the Jews. Herod is so disturbed by this, that his rule may be overthrown, that he orders every male child under the age of two in Bethlehem to be killed. The angel of the Lord appears to Joseph and tells him to take Mary and the baby to Egypt. Jesus was born, this is the Christmas message. 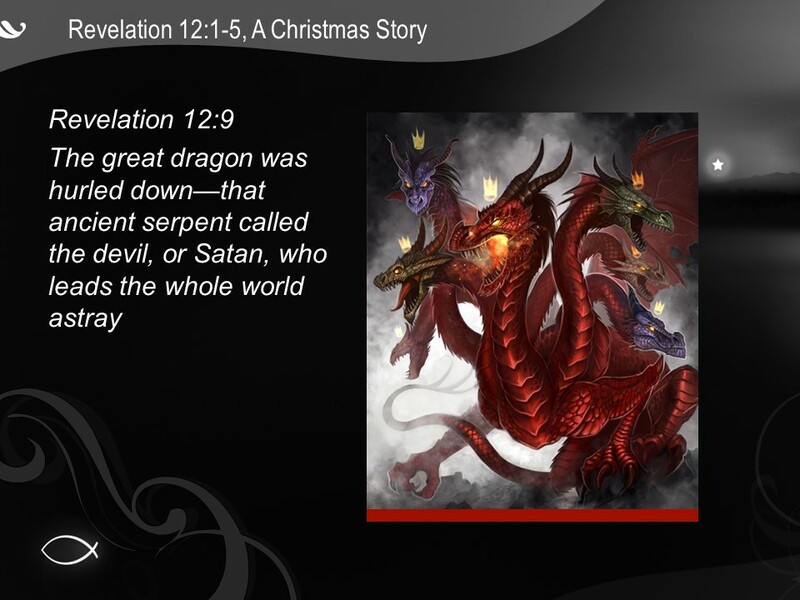 Matthew 2 tells the story from the perspective of the earthly realm, Revelation 12:1-5 tells the same story from the spiritual realm perspective, as Satan tries to prevent the birth of our Savior. Revelation 12:1-5 tells us a history lesson about Satan’s failed strategy to prevent the birth of the Messiah..
Verse 4, the angelic realm’s perspective of the devil trying to destroy the Messiah before He was born, we have to realize that this isn’t the only time Satan tried to destroy the Messiah. Throughout the Old Testament, the devil tried many times to prevent the arrival of the Messiah. Satan is trying a preemptive attack, trying to prevent the arrival of the Messiah and prevent God’s prophecies, because the devil knows he loses the spiritual warfare and Jesus will conquer death. Satan is a fallen angel that believes he can take the place of God, and he used Herod’s insecurities to kill every baby in Bethlehem, but Mary and Joseph fled to Egypt and escaped. Before that, the devil tried for millennia to prevent the birth of Jesus. Before Herod (Matthew 2), Cain killed Abel. Satan believed since God had accepted Abel’s sacrifice, then the Messianic line would certainly come through Abel (Genesis 4, 1 John 3:2). God’s plan, though, was through the lineage of Abel’s younger brother Seth. Then, in Exodus 1, Pharaoh tried to drown all the Jewish babies. In 2 Chronicles 22, Athaliah tries to destroy all the royal offspring of the house of Judah, but the priest hid Joash in the temple and the Messianic line is preserved. In the book of Esther, Haman tried to exterminate all the Jews. Satan is called the prince of this world, and he doesn’t want to give it up. It’s all he has. He even tried to tempt Jesus in Matthew 4:5-7 by offering Him the kingdoms of this world. Jesus didn’t disagree that Satan was the prince of this world. But the history is past, God is in control, and the Messiah, our Savior is brought into this world. The devil loses. How wicked, how dangerous the devil then becomes. Now the devil needs a new strategy; to destroy Israel. God promised Abraham in Genesis 12:3 that in him, all the nations of the world will be blessed. Israel is the only nation that God started directly and has a covenant with God. God will bless Israel, and Israel will bless the world, that’s God’s plan. Israel has already blessed us. Israel has provided scripture – all the authors of the bible with the possible exception of Luke were Jewish. It says in Romans 3:2 that the Jews were entrusted with the very words of God. The Jews gave us a Savior. Did you know Jesus wasn’t Baptist? No, He was a Jew. And it says in Isaiah 2:2-3 that the Kingdom in the future would be headquartered in Jerusalem. So just like Revelation 12:1-5 is Satan’s past failed strategy, Revelation 12:6-17 is Satan’s present and future strategy, also failed. Satan is trying to do a preemptive strike to destroy the nation of Israel to prevent the coming of the kingdom. To understand the symbology, the woman is Israel, as we’ve studied. The wilderness most scholars believe to be the city of Petra, in the wilderness, to be taken care of my God. And 1,260 days means… 1, 260 days. 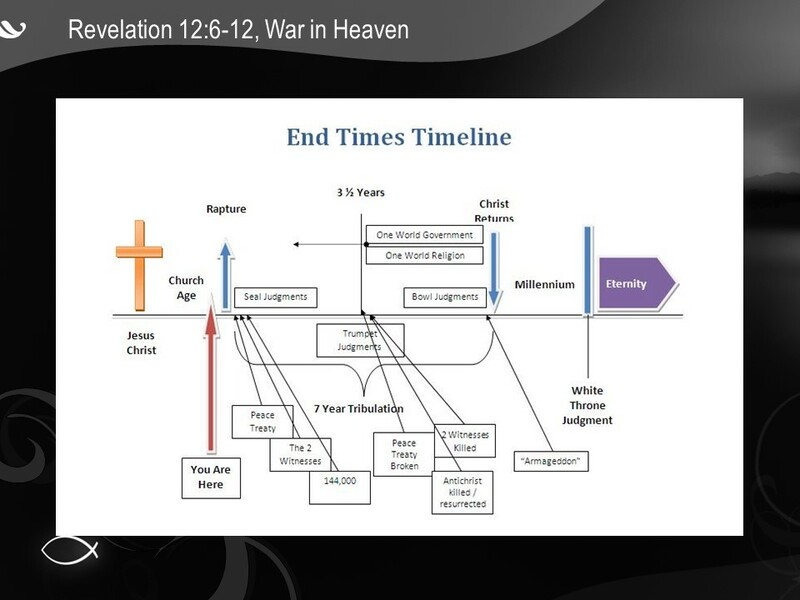 The study of eschatology is the theology of the end times for mankind and the word. We’re not going to get into the various comparisons, other than to note that not all scholars agree on how the future unfolds. In the eschatology of a pre-Tribulation worldview, first comes the Rapture where believers meet Jesus in the air according to the 1 Thessalonians 4:15-17. Then begins seven years of Tribulation as God pours out His wrath, and Jesus comes to establish 1000 years of the millennial kingdom on earth. At the midpoint of the seven years of Tribulation, there is a blasphemous desecration of the temple in Jerusalem, and Jesus tells the Jews in Matthew 24:15 that they are to flee to the mountains. And this is where we find ourselves in Revelation 12:6 as the woman flees to the desert for 1260 days, which is 3 and 1/2 years. 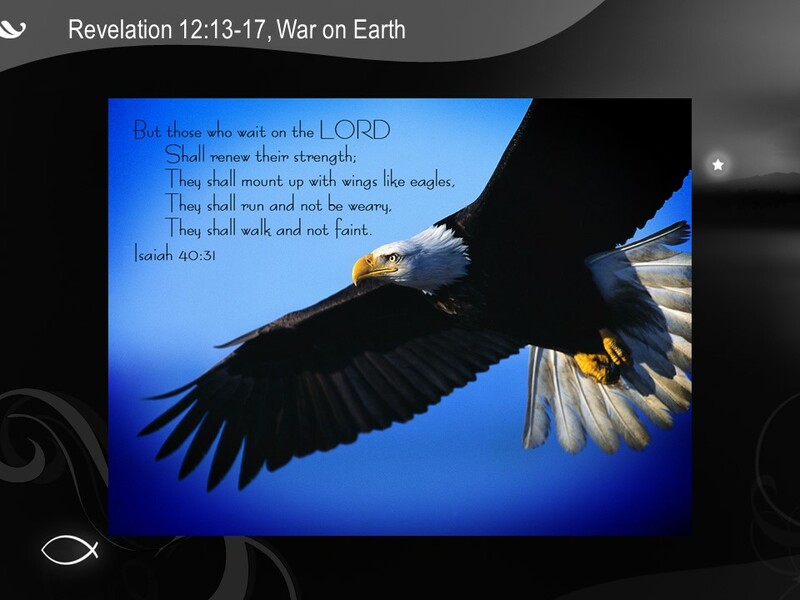 We are looking at these verses that describe the spiritual war from the angelic realm. Satan is furious. Christ is coming, the Lion of Judah, and bringing the Kingdom of God. Up to this point, Satan believes he can still thwart God. Satan has access to God’s throne room – remember in Job 1 where God and Satan have a discussion about Job’s future? Satan is in God’s throne room, not to worship as other heavenly beings do, but to accuse. In fact, this verse says Satan accuses us before our God day and night. We should be careful we ourselves do not become accusers. The side doing the accusations has an ally that we should want nothing to do with. But now, halfway through the Tribulation, Satan is thrown down from heaven, permanently. Then we look at verse 13, and Satan is losing the war. He has already failed in the past when he was unable to prevent the coming of the Messiah, then he loses access to the heavenly throne room as he is thrown down, and here in the future, furious, Satan pursues Israel in earnest because he knows he only has 3 1/2 years to prevent God’s kingdom on earth. And just like God rescued the Messianic line from Satan’s plans, now God rescues the woman Israel. When the dragon saw that he had been hurled to the earth, he pursued the woman who had given birth to the male child. The woman was given the two wings of a great eagle, so that she might fly to the place prepared for her in the wilderness, where she would be taken care of for a time, times and half a time, out of the serpent’s reach. Then from his mouth the serpent spewed water like a river, to overtake the woman and sweep her away with the torrent. But the earth helped the woman by opening its mouth and swallowing the river that the dragon had spewed out of his mouth. Then the dragon was enraged at the woman and went off to wage war against the rest of her offspring—those who keep God’s commands and hold fast their testimony about Jesus. The most difficult part of Revelation 12 for me to figure out was “time, times, and half a time.” Sounds like a math problem, and I’m an engineer, I should be able to figure this out. It’s just a weird way of saying 3 1/2 years or 1260 days. “Time” is “1 year,” “times” is “2 years” and then add “half a time” for a total of 3 1/2 years. Satan’s final efforts to destroy Israel will also fail. Notice Israel is given “the two wings of a great eagle.” This symbology comes from Exodus 19:4, when God protected Israel from Pharaoh. God tells Moses to say to the people of Israel, “You yourselves have seen what I did to Egypt, and how I carried you on eagles’ wings and brought you to myself.” The image of being carried on eagles’ wings shows God’s protection during persecution, carried safely out of harm’s way. This is God’s divine protection. Some scholars have tried to interpret the eagles’ wings as being protected by the USA who has the bald eagle as our emblem. I’d like to say we will continue to protect Israel, but sadly, that’s not to be the case. The USA, too, will one day persecute Israel. Indeed, just in the last month the USA struck a deal with Iran so that Iran will have nuclear technology. Iran then chants, “Death to America” and pledges to wipe Israel off of the map with nuclear weapon technology provided by the USA. Wiping Israel off the map, though, would actually be an improvement, though, because the official world map from Iran doesn’t even show Israel. 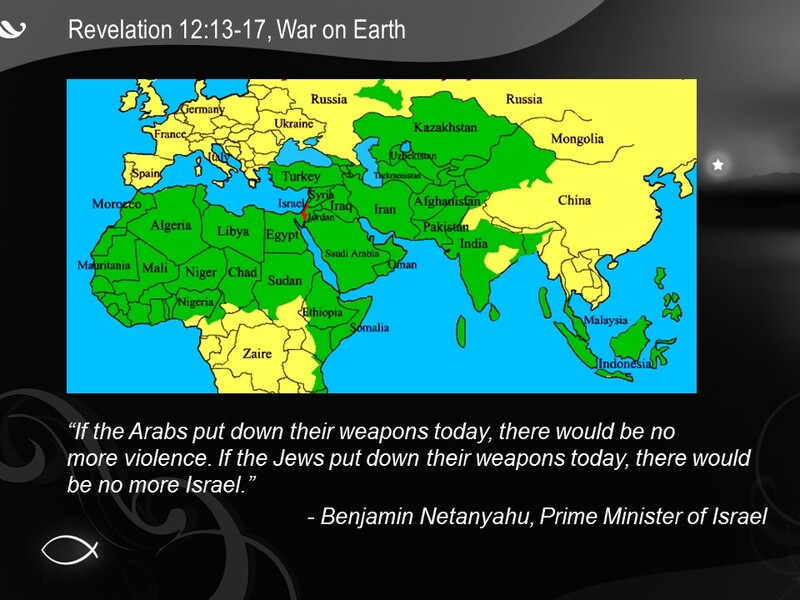 I guess that means they will put Israel on the map first, then wipe Israel off. Psalm 83:4 sounds exactly like something the leader or Iran might say. Satan been trying throughout the ages to destroy Israel. Perhaps he thought for a while he succeeded – the Romans destroyed the temple in Jerusalem in 70AD and the Jewish diaspora were scattered throughout the earth. Even without a country, the Jewish people and culture survived, so Hitler and his Nazis destroyed 6 million of them in World War II. And still Satan was unsuccessful, and when the United Nations reestablished Israel as a nation in 1948 after nearly 1900 years without a country, Satan realized his plan was failing again. Satan knows scripture, and he knows how badly things end for him. But he believes he can replace God, and there is no end of his deceptions and lies in order to thwart God’s will. 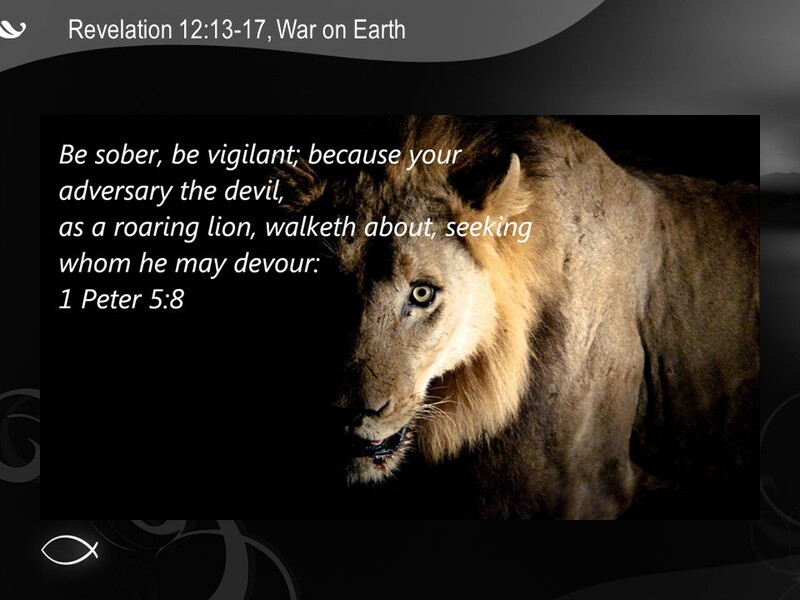 1 Peter 8 says that your enemy, the devil, prowls around like a roaring lion looking for someone to devour. And if you think the deceptions and lies and accusations he uses against Christians are tormenting, it pales when measured against Satan’s fury against Israel. See, God’s plan is to bless Israel, and Israel will bless the nations. Satan’s plan is not. I believe antisemitism, and hatred of the descendants of Abraham, Isaac and Jacob, is driven by Satan himself. The desire to wipe out Israel is our earthly demonstration of the war in heaven and is rooted in the angelic conflict of good versus evil. Jerusalem will be at the center of the Kingdom of God and of His Christ according to Zechariah 14:17 and several other verses. Satan hates this. Once the kingdom comes, his kingdom of this world is permanently ended, he is permanently bound and thrown into the lake of fire. Be ever careful and vigilant to stay on the side of good. Nobody is immune from Satan’s lies and deceits. We have a God of love and forgiveness and grace, and all hatred is against His will, but antisemitism is especially evil and comes from the devil. Satan has an evil plan for this hatred of Israel. This battle in heaven with the battle on earth that mirrors it is widely perceived as a struggle between good and evil. There are wars and famine and death in this world that may seem evil is winning, but it’s not. Sata is dangerous, but Satan also is defeated. The battle isn’t even close. Jesus wins overwhelmingly. I love much of what you write but the order is backwards on the second coming – the bad get gathered first according to all that Jesus taught (think of bad fish parable) and Mat 24. I used to buy the Jenkins Delusion and read all his books but one day a wise old believer asked me to reread the Bible without any preconceived notiions if I could and it totally opened my eyes! I pass the challenge on to you, brother and may God bless you!